The city of Portland, Oregon, has always been serious about saving energy in its buildings. In fact, the city’s website displays maps and spreadsheets showing the energy performance of hundreds of commercial buildings, ranking them from lowest to highest performers. But how do Portland permitting officials and building owners decide which buildings to prioritize for energy-saving retrofits? Thanks in part to PNNL research, these decision makers now have a better way to see which buildings could provide the biggest boosts in energy savings. 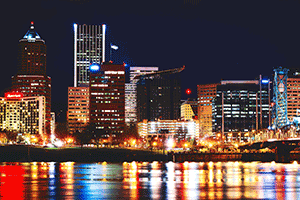 Portland already knows how much energy its commercial buildings use. Since 2015, the city has required owners of commercial buildings larger than 20,000 square feet to track and report annual energy use. This policy covers nearly 80 percent of the commercial square footage and approximately 1,000 buildings. But there is a gap. City officials didn’t know about the expected energy performance of these structures, making it difficult to identify the best opportunities for building upgrades. Here’s how it works. Utility bills can help identify actual energy use of a building, but they don’t tell you whether high energy use is caused by longer than usual operational hours or inefficient systems. So, if you knew how much energy a building should be using—based on its lighting, HVAC systems, insulation, and so on—but it’s actually using much more than that, you could prioritize that building for a more in-depth energy assessment and perhaps even upgrades. It’s a smart bet because you know that the building has the potential to perform much better than it has been. To help Portland explore this idea in more depth, the U.S. Department of Energy awarded the city financial assistance through the Cities Leading through Energy Analysis and Planning (Cities-LEAP) program. The Portland LEAP project had two objectives: First, identify key building characteristics that would predict energy performance, and second, analyze and compare measured and predicted energy performance. PNNL research engineer Supriya Goel assisted Portland with a PNNL-developed software tool called the Building Energy Asset Score to evaluate an initial group of 26 Portland office buildings. The tool uses an energy model to score a building’s expected energy efficiency, based on its design and characteristics. It assesses the as-designed efficiency of a building, regardless of how it is operated. Think of the Asset Score like the fuel economy stickers on new cars, that tell you how many miles per gallon that vehicle is supposed to give under standard driving conditions. But instead of fuel economy, the Asset tool tells you how much energy your building should be using. Goel assisted Portland’s subcontractor, Whole Building Solutions, in developing the Asset scores for the 26 buildings. That company provided the energy ratings to The Cadmus Group, LLC, which compared them with how much energy the buildings actually used. The results showed which buildings had the best opportunities to improve energy performance through upgrades. Energy consumption was most affected by lighting and HVAC system efficiency and controls. Based on the study results, Energy Trust of Oregon will conduct follow-on research on some of the highest-opportunity buildings, comparing energy use before and after building retrofits. In addition, Portland and its partners are planning ways to share the project research and lessons learned with other cities. This study is important because it showed that this kind of data comparison and analysis can save money and time when Portland looks at building energy efficiency opportunities. It’s like a screening tool. If Portland officials know which buildings could benefit from a more detailed assessment, they could send on-site auditors only to those buildings to identify specific upgrades that would help. The study was also important because it showed the continuing value of the Building Energy Asset Score tool. PNNL developed the tool and the rating system, with funding from the U.S. Department of Energy’s Building Technologies Office. The Asset Score is now a free, national standardized tool for assessing the physical and structural energy efficiency of commercial and multifamily residential buildings. This research was funded by DOE’s Office of Strategic Programs within the Office of Energy Efficiency & Renewable Energy.